Peters, J., Janzing, D., Schölkopf, B.
Gretton, A., Hennig, P., Rasmussen, C., Schölkopf, B. Progress in micro- and nano-scale science and technology has created a demand for new microsystems for high-impact applications in healthcare, biotechnology, manufacturing, and mobile sensor networks. The new robotics field of microrobotics has emerged to extend our interactions and explorations to sub-millimeter scales. This is the first textbook on micron-scale mobile robotics, introducing the fundamentals of design, analysis, fabrication, and control, and drawing on case studies of existing approaches. The book covers the scaling laws that can be used to determine the dominant forces and effects at the micron scale; models forces acting on microrobots, including surface forces, friction, and viscous drag; and describes such possible microfabrication techniques as photo-lithography, bulk micromachining, and deep reactive ion etching. It presents on-board and remote sensing methods, noting that remote sensors are currently more feasible; studies possible on-board microactuators; discusses self-propulsion methods that use self-generated local gradients and fields or biological cells in liquid environments; and describes remote microrobot actuation methods for use in limited spaces such as inside the human body. 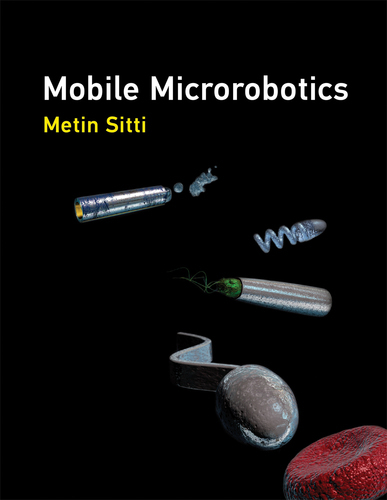 It covers possible on-board powering methods, indispensable in future medical and other applications; locomotion methods for robots on surfaces, in liquids, in air, and on fluid-air interfaces; and the challenges of microrobot localization and control, in particular multi-robot control methods for magnetic microrobots. Finally, the book addresses current and future applications, including noninvasive medical diagnosis and treatment, environmental remediation, and scientific tools. Schölkopf, B., Luo, Z., Vovk, V.
Autonomous robots may become our closest companions in the near future. While the technology for physically building such machines is already available today, a problem lies in the generation of the behavior for such complex machines. Nature proposes a solution: young children and higher animals learn to master their complex brain-body systems by playing. Can this be an option for robots? How can a machine be playful? The book provides answers by developing a general principle---homeokinesis, the dynamical symbiosis between brain, body, and environment---that is shown to drive robots to self-determined, individual development in a playful and obviously embodiment-related way: a dog-like robot starts playing with a barrier, eventually jumping or climbing over it; a snakebot develops coiling and jumping modes; humanoids develop climbing behaviors when fallen into a pit, or engage in wrestling-like scenarios when encountering an opponent. The book also develops guided self-organization, a new method that helps to make the playful machines fit for fulfilling tasks in the real world. Fossati, A., Gall, J., Grabner, H., Ren, X., Konolige, K.
Sra, S., Nowozin, S., Wright, S.
The interplay between optimization and machine learning is one of the most important developments in modern computational science. Optimization formulations and methods are proving to be vital in designing algorithms to extract essential knowledge from huge volumes of data. Machine learning, however, is not simply a consumer of optimization technology but a rapidly evolving field that is itself generating new optimization ideas. This book captures the state of the art of the interaction between optimization and machine learning in a way that is accessible to researchers in both fields. Optimization approaches have enjoyed prominence in machine learning because of their wide applicability and attractive theoretical properties. The increasing complexity, size, and variety of today's machine learning models call for the reassessment of existing assumptions. This book starts the process of reassessment. It describes the resurgence in novel contexts of established frameworks such as first-order methods, stochastic approximations, convex relaxations, interior-point methods, and proximal methods. It also devotes attention to newer themes such as regularized optimization, robust optimization, gradient and subgradient methods, splitting techniques, and second-order methods. Many of these techniques draw inspiration from other fields, including operations research, theoretical computer science, and subfields of optimization. The book will enrich the ongoing cross-fertilization between the machine learning community and these other fields, and within the broader optimization community. Barber, D., Cemgil, A., Chiappa, S.
Lu, H., Schölkopf, B., Zhao, H.
From an engineering standpoint, the increasing complexity of robotic systems and the increasing demand for more autonomously learning robots, has become essential. This book is largely based on the successful workshop "From motor to interaction learning in robots" held at the IEEE/RSJ International Conference on Intelligent Robot Systems. The major aim of the book is to give students interested the topics described above a chance to get started faster and researchers a helpful compandium. Bakir, G., Hofmann, T., Schölkopf, B., Smola, A., Taskar, B., Vishwanathan, S.
Machine learning develops intelligent computer systems that are able to generalize from previously seen examples. A new domain of machine learning, in which the prediction must satisfy the additional constraints found in structured data, poses one of machine learnings greatest challenges: learning functional dependencies between arbitrary input and output domains. This volume presents and analyzes the state of the art in machine learning algorithms and theory in this novel field. The contributors discuss applications as diverse as machine translation, document markup, computational biology, and information extraction, among others, providing a timely overview of an exciting field. Chapelle, O., Schölkopf, B., Zien, A. In the field of machine learning, semi-supervised learning (SSL) occupies the middle ground, between supervised learning (in which all training examples are labeled) and unsupervised learning (in which no label data are given). Interest in SSL has increased in recent years, particularly because of application domains in which unlabeled data are plentiful, such as images, text, and bioinformatics. This first comprehensive overview of SSL presents state-of-the-art algorithms, a taxonomy of the field, selected applications, benchmark experiments, and perspectives on ongoing and future research. Semi-Supervised Learning first presents the key assumptions and ideas underlying the field: smoothness, cluster or low-density separation, manifold structure, and transduction. The core of the book is the presentation of SSL methods, organized according to algorithmic strategies. After an examination of generative models, the book describes algorithms that implement the low-density separation assumption, graph-based methods, and algorithms that perform two-step learning. The book then discusses SSL applications and offers guidelines for SSL practitioners by analyzing the results of extensive benchmark experiments. Finally, the book looks at interesting directions for SSL research. The book closes with a discussion of the relationship between semi-supervised learning and transduction. Gaussian processes (GPs) provide a principled, practical, probabilistic approach to learning in kernel machines. GPs have received increased attention in the machine-learning community over the past decade, and this book provides a long-needed systematic and unified treatment of theoretical and practical aspects of GPs in machine learning. The treatment is comprehensive and self-contained, targeted at researchers and students in machine learning and applied statistics. The book deals with the supervised-learning problem for both regression and classification, and includes detailed algorithms. A wide variety of covariance (kernel) functions are presented and their properties discussed. Model selection is discussed both from a Bayesian and a classical perspective. Many connections to other well-known techniques from machine learning and statistics are discussed, including support-vector machines, neural networks, splines, regularization networks, relevance vector machines and others. Theoretical issues including learning curves and the PAC-Bayesian framework are treated, and several approximation methods for learning with large datasets are discussed. The book contains illustrative examples and exercises, and code and datasets are available on the Web. Appendixes provide mathematical background and a discussion of Gaussian Markov processes. Schölkopf, B., Tsuda, K., Vert, J. Modern machine learning techniques are proving to be extremely valuable for the analysis of data in computational biology problems. One branch of machine learning, kernel methods, lends itself particularly well to the difficult aspects of biological data, which include high dimensionality (as in microarray measurements), representation as discrete and structured data (as in DNA or amino acid sequences), and the need to combine heterogeneous sources of information. This book provides a detailed overview of current research in kernel methods and their applications to computational biology. Following three introductory chaptersan introduction to molecular and computational biology, a short review of kernel methods that focuses on intuitive concepts rather than technical details, and a detailed survey of recent applications of kernel methods in computational biologythe book is divided into three sections that reflect three general trends in current research. The first part presents different ideas for the design of kernel functions specifically adapted to various biological data; the second part covers different approaches to learning from heterogeneous data; and the third part offers examples of successful applications of support vector machine methods. In the 1990s, a new type of learning algorithm was developed, based on results from statistical learning theory: the Support Vector Machine (SVM). This gave rise to a new class of theoretically elegant learning machines that use a central concept of SVMs-kernelsfor a number of learning tasks. Kernel machines provide a modular framework that can be adapted to different tasks and domains by the choice of the kernel function and the base algorithm. They are replacing neural networks in a variety of fields, including engineering, information retrieval, and bioinformatics. Learning with Kernels provides an introduction to SVMs and related kernel methods. Although the book begins with the basics, it also includes the latest research. It provides all of the concepts necessary to enable a reader equipped with some basic mathematical knowledge to enter the world of machine learning using theoretically well-founded yet easy-to-use kernel algorithms and to understand and apply the powerful algorithms that have been developed over the last few years. Smola, A., Bartlett, P., Schölkopf, B., Schuurmans, D.
The concept of large margins is a unifying principle for the analysis of many different approaches to the classification of data from examples, including boosting, mathematical programming, neural networks, and support vector machines. The fact that it is the margin, or confidence level, of a classification--that is, a scale parameter--rather than a raw training error that matters has become a key tool for dealing with classifiers. This book shows how this idea applies to both the theoretical analysis and the design of algorithms. The book provides an overview of recent developments in large margin classifiers, examines connections with other methods (e.g., Bayesian inference), and identifies strengths and weaknesses of the method, as well as directions for future research. Among the contributors are Manfred Opper, Vladimir Vapnik, and Grace Wahba.